**PLEASE NOTE ** The colors in these deigns are only SUGGESTIONS, You can pull the DAK .pat files into your own DAK software and depending on the multi-color capability of your knitting machine, choose your own colors to suit your needs. 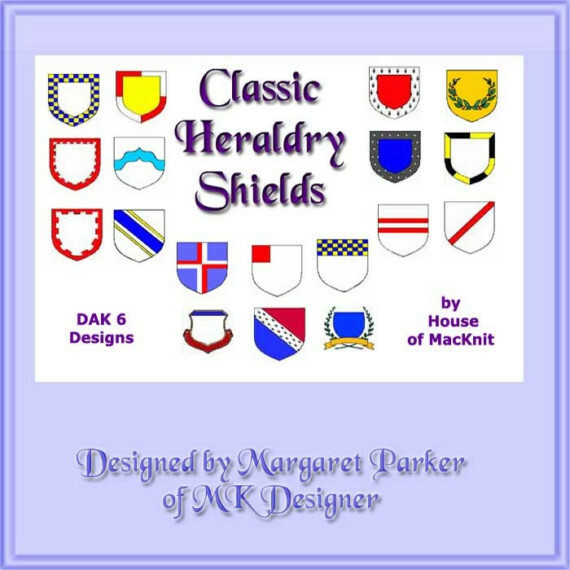 Days of old ... We have a collection of 18 CLASSIC shields for you in this collection. These patterns have so many variations. They were designed in DAK6. FREE Tabbard Pattern Included. Put your family name on these shields and proudly wear them to the next tournament or make a wall hanging for display.